In advance of refurbishing the Library Building’s 3rd Floor, we’ve moved arts and humanities print books to the 2nd and 4th Floors. 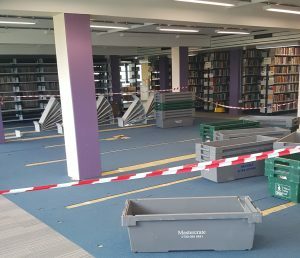 This is part of our strategy to always give you access to print books in the Library throughout the Refurbishment Project, although they will move location from time to time as work is carried out on different floors, and follows our making space for books by moving print journals off-site. Where are arts and humanities books? Art and humanities books previously shelved on the 3rd Floor include those with Call Numbers in the 100s (philosophy, psychology), 200s (religion), 400s (languages), 700s (arts), 800s (literature), music CDs and the Teaching Practice Collection. Language dictionaries and 3rd Floor Reference books. 100s, 200s, 400s, 700s, 800s larger size items (Call Numbers beginning ‘folio’ or ‘middle folio’). Teaching Practice Collection, including kits. The catalogue is updated and revised floor plans are in place. If you have any difficulty locating anything, please ask us for help at the 2nd or 4th Floor Information Desks. 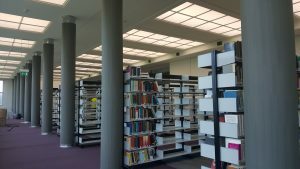 Find more about the Library’s major £40 million refurbishment on the Library Refurbishment Project webpage (see FAQ 6 on book moves) or email us at library@reading.ac.uk. This entry was posted in Borrowing and viewing material, General news, Refurbishment, Vacation information. Bookmark the permalink.